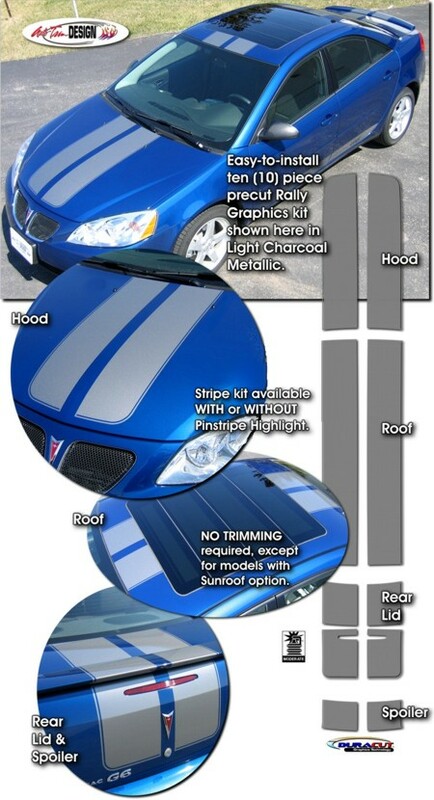 Make your ‘05-'10 Pontiac G6 Sedan "Tough-looking" with this Rally Stripe graphics kit. Easy-to-install kit can be ordered with or without a classic .20" (5.08mm) pinstripe at the perimeter as shown. They're PRECUT, ready to install in a wide variety of colors - NO TRIMMING required (except for G6 Sedan models with Sunroof option)! Stripe package is not just a set of 8.5" (21.59cm) strips in a box. Kit consists of prefitted, tapered and contoured pieces as shown. This kit is specifically made for the ‘05-'10 Pontiac G6 Sedan factory hood, roof and rear lid areas and will not fit any other vehicle. Pieces for G6's factory spoiler are also available (kit part #ATD-PNTG6GRPH3 includes pieces for the G6 Factory Low Profile Spoiler). Rally stripes are set for 2.25" (57.15mm) center spacing at time of installation. Kit part #ATD-PNTG6GRPH9 is specifically designed for G6's with the GXP Sport Appearance Package (SAP) style Hood (GM Part #25839143). Optional spoiler kit part #ATD-PNTG6GRPH10 is specifically designed for the G6 GXP Sport Appearance Package (SAP) style Hammerhead Spoiler (GM Part #25876648). Trimmable two (2) piece Spoiler Kit (ATD-CHVCBLTGRPH4) includes two (2) 11" x 16" (27.94cm x 40.64cm) pieces that can be hand trimmed for custom spoiler applications.